Commercial Real Estate Developers, Multifamily Developers, Shared Office Building Developers, and Property Management Companies. Smart Access Control Software, Electronic Access Control Hardware (Bluetooth locks and controllers), Mechanical Access Control Hardware (passage levers and knobs). This is an amazing opportunity to be a part of the explosive growth in smart apartments, smart buildings, and smart home technology. Earn $25,000 or more in commission for each deal closed! 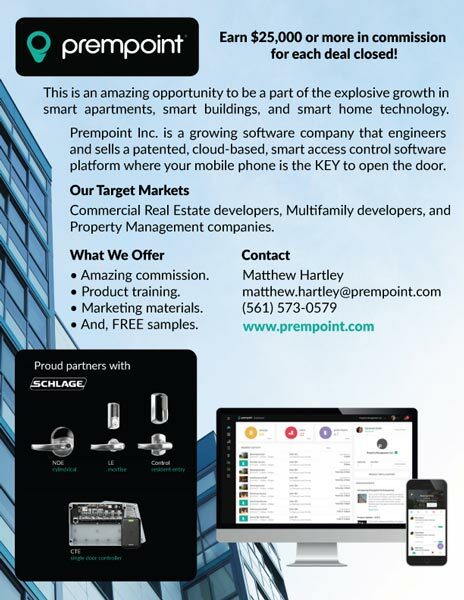 Prempoint Inc. is a growing software company that engineers and sells a patented, cloud-based, smart access control software platform where your mobile phone is the KEY to open the door. We are looking for Manufacturer Reps that have an existing network of Commercial Real Estate developers, Multifamily developers, and/or Property Management companies, where you can present our solution at the ground floor of any new development project or new rehab project that is taking place on existing properties. Our reps are provided training and the tools necessary to sell our solution. A rep can make anywhere between $10,000 to $25,000 or more in commissions for each deal closed depending upon the size of the property. The market is wide open and the sales potential is HUGE!